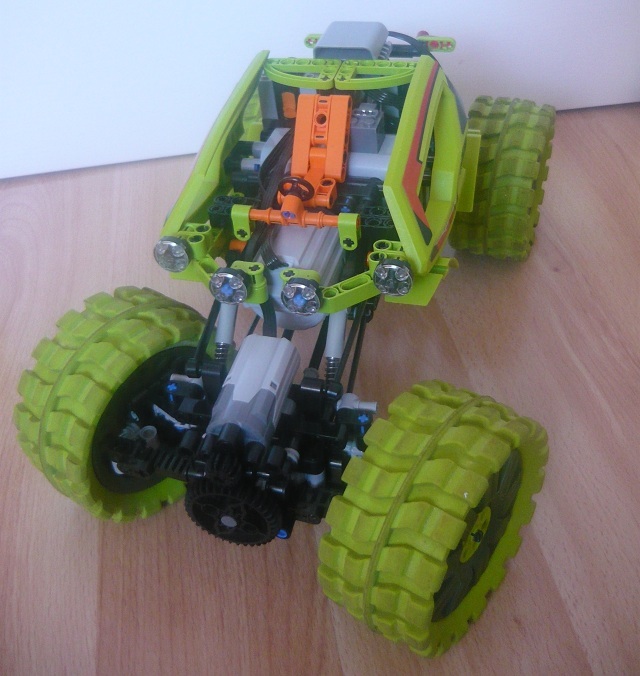 This is one of the latest creations from Zblj, a Technic/Racers hybrid offroader which uses the wheels and some other parts from 8675, Outdoor Challenger (Outdoor RC subtheme, from Racers). This is a less obvious combination that most, should never though about. But the result is quite impressive and versatile. This monster can climb on a smooth surface at 55 degree angle. According to Jernej it features an independent left/right side wheel drive, very flexible 4 link suspension on both axels, lighter body and bigger wheels with more traction and profile. You ma find more photos from the Avenger, at Jernej's Brickshelf folder. Wow, I always thought the only Outdoor RC parts compatible with the "regular" LEGO system were the shock absorbers! I've tried this, and been stuck at meshing the Outdoor RC wheels to standard Technic pieces. How was it done here? Thanks! I will have to try that. I've wanted to use these wheels for outdoor rovers for a while now, and you may have provided the key. Thank you again - wonderful MOC!